Some weeks ago I read about a system quite similar to KIVA and after our last logistic lecture I was animated to write about that system. The company which innovates the system G-Com solutions is called Grenzebach and is located in Germany. It owns subsidiaries all over the world and was founded in 1960, so the company has a long tradition. One of their core competences are logistic solutions. They are developing technologic solutions to feed especially the European market. Besides palettizing solutions they offer an extensive variety of intelligent and pilotless transportationsystems (FTS). The idea is to use the fastest and safest root to the destination independently of the compexity of the environment. The key is to transport storage shelves to the pickstation. 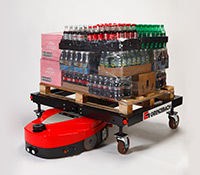 The red intelligent carry is called G-Pro and can transport goods with up to 1,2 tons and a speed of 60 meter per minute. It can turn 360, therefor it saves a lot of storage capacity. The batteries are reloaded during the ride via induction loops. The navigation is ensured by codes which are installed on the floor. The G-Pro can be combined with existing systems. A light (laser) shows the operator which item has to be picked. Additionally the item can be scanned for a lower error rate. Then the operator knows where to put the item because of the light display on the shelf (put to light). By that system the staff costs can cut significantly and the efficiency of the warehousing logistic can be increased. According to “Logistik Heute”, 500 picks per hour are possible and it already pays by 900 sendings per day. In the month of April the world’s top designers will start a journey in Australia that will end in Zurich to present their Spring-Fall- Winter Collections for 2015/2016 in the runways. DHL is the Official Logistics Provider for Mercedes-Benz Fashion Week since year 2012. For a niche in the market that has not been exploted, DHL designed a tailor-made logistics solution for a total of 30 Fashion Week around the world, exactly across 15 cities. Mercedes-Benz fashion week is a event that lasts seven days and includes more than 90 designers from more than 30 different countries, clearly expert logistics is vital for the success of the shows. DHL employees become part of the staff and heroes by handling all the shows logistics, starting with the delivery of haute couture masterpieces to transport of equipment to and from catwalk venues. DHL fashion customers range from multinational retail groups with complex distribution requirements to small, independent boutiques that need individual service. They offer to both customers consistent transit times, even from remote manufacturing locations in Asia, they give full visibility of the shipments across the supply chain, they take advantage of their expertise in trade regulations, transportation, consolidation, warehousing and value added services, with this they deliver the goods with a record speed. DHL also offers designers and fashion houses the opportunity to use its GOGREEN carbon-offset transport services for their collections, reflecting the increasing importance of sustainable practices in the fashion industry. Nike’s China Logistics Center (Taicang, Jiangsu) uses network, equipment and voice picking to operate more efficiently than traditional distribution centers. Nike’s interest to do the best and being environmentally sustainable led the company to take advantage of a two million square foot distribution center, is the company’s largest distribution center in Asia.This center handeles apparel and footwear shipments for mainland China. The facility is designed to be more efficiently and accurately than other centers, they use conveyour network, high-tech sortation equipment and technologies. To reduce energy consumption by 75 percente the company uses cross-belt and tilt-tray sorters instead of linear synchronous motor technology, this change is helping Nike to achieve his core corporate goals: increased operational efficiency, shipping flexibility and accuracy, lower handling costs, sustaintability. The process starts wby unloading cartons from trucks in the receiving area and then stacked on pallets, this later are moved to narrow aisle in the warehouse. Later pallet loads and cartons are selected from this aisels and transferred onto conveyor that merges cartons onto a line sorter. There are three destinations depending on how the goods are to be shipped. Items unpacked are placed into storage racks where operators pick an place individual items into plastic totes. Conveyor transports the totes to a conveyor on level 2. These totes and whole cartons containing batches of the same item are then merged before being emptied and placed manually onto the cross-belt pre-sorter. This sorts the items in the totes into pre-defined hoppers, later these are emptied at the hopper tipping area, from where a system of belt conveyors transports them to manual inductions for loading onto the final sorter. This sorter is a second cross-belt, wich automatically distributes the individual items into chutes that have been specially designed for Nike . The chutes feature dividers that rise following the delivery of a complete batch, thereby separating it for packing into a single carton by the operator below. The carton is then pushed onto a roller conveyor for delivery to a Crisplant LS-4000E tilt-tray shipping sorter. The sorter system and machine controls are integrated with Nike’s Warehouse Management System. Combining precise control of individual machines, with system-wide visibility of workflows, enables continual optimization of the system and avoidance of bottlenecks. Nike entered a service agreement with company Crisplant to ensure uptime, service engineers are stationed on-site for support and mantainance. Clad-rack or self supporting warehouses are compact structures formed basically by shelves, the roofing and walls, and the main characteristic is that the system integrates these shelves as a part of the supporting structure. They are defined as a high density storage capacity in height. The major construction height is just limited by the local regulations or by the scope of the handling means, and it can even overcome 35 m high. This is a really good feature because it enables to maximize the available space. It is not necessary any previous building for installing a self-supporting warehouse, so the investment cost and the runtime are reduced. It is easy to do future expansion and space losses are avoid because it is projected according with the necessary means. It is possible to apply different automation levels in order to obtain the maximum yield. This kind of warehouse allows the use of very different storage systems and with a high degree of automation. In order to obtain the highest capacity, the loads are placed in line with the principle of “empty space”; that means, when there is an entering pallet, it is assigned the first empty space in the hall where the lifting equipment is working in that moment and the computer memorize the shelf and position for the next extraction following the set out criteria in the store. Also, if you are interested, I suggest that you watch in the link below a 5 minutes video of a large clad-rack warehouse construction. The next post would be for the week from 16 to 20 March, but with a little delay. In one of the relevant tasks of the same week, I had to mention the Ford Motor Company and, after searching for information about it, I found interesting facts related to logistics. The physical logistics operations of Ford provide a safe and efficient transportation of parts from suppliers to manufacturing plants. It is also safe and efficient transportation of finished cars from its assembly lines to its dealers vehicles. I want to emphasize that Ford is working towards maximizing the efficiency of logistics operations and at the same time reducing environmental impact. A curious fact, and that I had never heard (or at least by that name) is the use of “green logistics”. Ford MP & L works with this type of logistics, which has an international global approach to coordinate these activities. They have experts in the subject in each of the regions in which it operates, and also they have a central intranet green logistics to help standardize their procedures and communication of best practices. It’s good to know that companies like Ford are concerned to improve its procedures , trying to protect the environment . These facts provide a more positive image of the company for both customers and workers. Don’t lose money by having many impatient people in the queue. Don’t lose money by paying employees in the cash register that are idle without customers to attend. 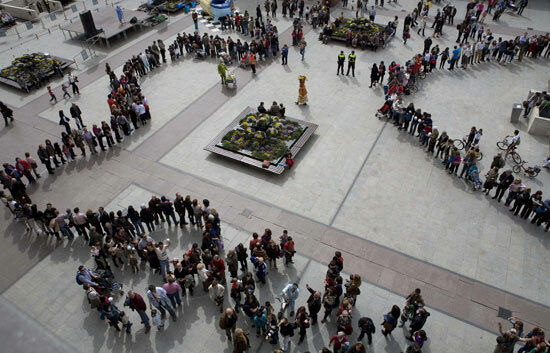 In these situations, it is very interesting to answer the questions: what is the percentage of time that there will be “n” people in a queue? What percentage of time will be the seller idle? The answers to these questions can be obtained through Markov Model. Markov Chain is a random process that undergoes transitions from one state to another on a state space. It’s required to possess a property that is usually characterized as “memoryless”: the probability distribution of the next state depends only on the current state and not on the sequence of events that preceded it. This specific kind of “memorylessness” is called the Markov property. Book: Problemas y Modelos Matemáticos para la Administración y Dirección de Empresas, Cortés López, J. Carlos. This book was written by one of the supervisors I had in the Final Thesis of my Degree here in Universidad Politécnica de Valencia and there you can find interesting solved problems about Markov Chain Model and so on. An important aspect of supply chain management is the co ordination of logistical operations for the transport of products within the supply chain. The task of designing delivery (or pickup) routes to service customers in a company’s supply chain is known in the literature as a vehicle routing problem (VRP). The Vehicle Routing Problem is a generic name given to a whole class of problems in which a set of routes for a fleet of vehicles based at one or several depots must be determined for a number of geographically dispersed cities or customers. The objective of the VRP is to deliver a set of customers with known demands on minimum-cost vehicle routes originating and terminating at a depot. Vehicle Routing Problems have been extensively analyzed to reduce transportation costs. The problem is to find a policy for routing the service vehicle that minimizes the average time demands spent in the system. Transport Network – A network of roads, streets, railways. Vehicles – Group of motor vehicles owned or leased by a business. Customers/ Suppliers -Important to determinate the location of all our customers. Warehouse – Storage of goods. Routes – Select the best routes possible.